Protects plastic, metal, bolt or cable seals from tampering. 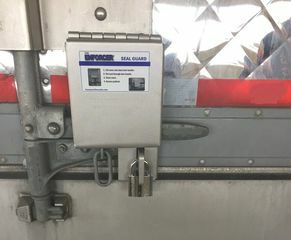 The Seal Guard™ Lock #5900 & #5950 (patent pending) is permanently installed on the trailer door securing plastic, metal, bolt or cable seals from tampering and unauthorized removal. Protect the security seals on your trailer or container with this Seal Guard™​ Lock. Portable, easy to install steel cover for cargo seals on trailers and containers. The sleeve and pin slide through the lever hasp to protect the back and sides. Adding the cover and lock ensures only the driver controls access to the seal for the entire cargo delivery run. Choose from a unique hex keyed bolt (5800) or traditional keyed cylinder (5850) locking system.